Peoples' memories are short. Apparently in Tallahassee, few recall what happened only one year ago after historic rainfall in mid-winter, normally Florida's dry season, filled Lake Okeechobee to the brim and caused water managers to freak out. Lake Okeechobee is the diseased, liquid heart of Florida. For more than seventy years and until very recently, the lake was used by Big Sugar -- that farms on hundreds of thousands of acres around the lake, mostly around its southern half -- as its cesspit. In wet season, Big Sugar used to routinely pump water off its fields back into the Lake. That runoff was laden with fertilizer and other chemicals, like sulfate, used to increase crop yields. In dry season, Big Sugar would pump water back onto its fields, nourishing the most heavily subsidized agricultural crop in America. Lake Okeechobee is part of a closed loop system that serves Big Agriculture, including dairy farms to the north. This closed loop system has worked extraordinarily well, thanks to the integration of industry profits in the operation of water management infrastructure. Those profits benefit some of the wealthiest farmers in the United States. The closed loop system requires constant attention; from water managers who work for state and federal agencies to the legislative and executive branches of government in Tallahassee who regulate both the flow of water and the quality of water. The system's many moving parts also include an army of lobbyists who serve the biggest corporations involved in sugarcane production: the Flo-Sun/ Florida Crystals empire owned by the Fanjul family, U.S. Sugar Corporation owned by the descendants of Charles Stuart Mott through a charitable trust, and other smaller, but important players like the King Ranch, the largest land-owner in Texas. There are some variables in the closed loop system that require the intervention of legislators and lobbyists. Environmental rules and regulations are one. The other: rainfall. Broadly speaking, environmental rules and regulations affect the region because the Everglades and water quality, downstream of Lake Okeechobee, are protected by law. So are the waters of Florida that serve the state's number one industry: tourism and real estate. Although businesses that involve tourism and real estate are attentive to water quality, as an historical matter it has never been its top priority. As long as the sun shines and the weather is warm in winter and taxes are low, the state's biggest profit centers are complacent. For Big Sugar, on the other hand, environmental regulations are critical. Florida's natural environment is uniquely susceptible to injury from the chemicals in fertilizer. Its needs are also upside down from the seasonal requirements to put water on and to dry down sugarcane. In other words, the closed loop system that serves both Florida politics and sugar industry profits has been superimposed over a natural system and that the entire arrangement mostly works unless one looks too closely -- through the lens of science -- and unless it rains too much. A year ago, too much rain fell in South Florida at the wrong time of year. In December and January, nearly two feet of rain fell causing lake levels to soar. Water managers, fearing an historically wet winter would be followed by a wet hurricane season, opened the lake's floodgates to lower water levels as a matter of caution and in consideration of a possible catastrophic failure of the lake's berm. Sugarcane fields stayed mostly dry as downstream real estate and tourism-related businesses on both Florida coasts were pummeled by a massive, months-long flood of terribly polluted water. The problem with the Lake Okeechobee closed loop system, long known to scientists, fishermen, and environmentalists, is that it doesn't include enough water storage and treatment marshes which could accommodate excess rainfall. Scientists are in agreement: for the closed loop system to work, and not destroy downstream Everglades or nearby estuaries and rivers, about 100,000 additional acres of land is required to create shallow, highly engineered marshes to cleanse pollution that is primarily attributable to Big Sugar's farming practices. That land must be purchased from Big Sugar by the State of Florida. There is the problem. Through its copious campaign contributions and through its careful organization of the political hierarchy in the state capitol, Big Sugar calls the shots. 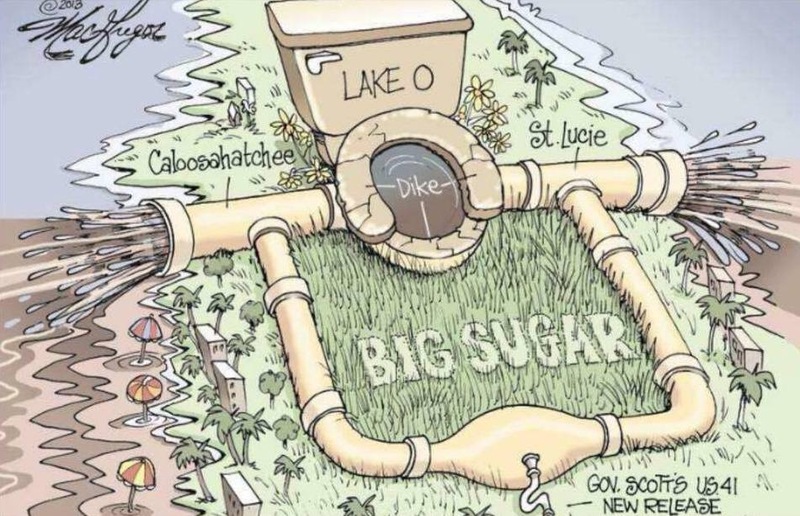 Because the state capitol is far from the population centers of South Florida impacted by Lake Okeechobee, and because Lake Okeechobee itself is geographically sequestered in the middle of the state, there is little occasion for the political order that serves Big Sugar to be troubled by urban and suburban populations. Until it rains too much. What happened in the winter of 2015 and 2016 was that the district of the incoming senate president Joe Negron was puked on by Lake Okeechobee. Negron didn't get to be selected as senate president, by his GOP peers, by standing up to Big Sugar. In fact, he has been -- like so many legislative leaders before him -- an enforcer within the Republican majority; who knows how political stars line up according to Big Sugar's influence. Negron also pays attention to science. As the rains fell, more than 200 scientists signed a letter to Florida Gov. Rick Scott, urging the speedy acquisition of lands from Big Sugar to solve the problem of massive pollution from Lake Okeechobee. Communities and activists on both Florida coasts organized to support the scientists, passing the Now or Neverglades Declaration through social media sites and related groups. Senator Negron has affirmed that land acquisition in the Everglades Agricultural Area is his top priority. It makes perfect sense that a legislative leader who has supported the closed loop system that delivers profits to Big Sugar would be the best advocate for fixing its costly deficiencies. All that is missing is political will of Negron's colleagues -- especially Democrats in the Senate and state representatives in the House. Florida's future depends, now, on how skillfully Senator Negron can navigate a budget process where Big Sugar stands in the shadows, using all its financial resources to steer the outcome. According to press reports, there are 64 lobbyists in Tallahassee today organized to block Senator Negron's yet-to-be-released bill. The question government always faces: who does democracy serve? If the question isn't constantly asked, the institutional exercise of democracy turns into an elaborate pageant or Kabuki drama where every role and plot-point has been honed through generations of actors. Each takes the stage to replace who came before. In time, with each successive performance, they become skilled, then aged by term limits, then fade from view to yield to a younger generation, trained by lobbyists. The retired stars are richly rewarded, with good seats in the skyboxes. Florida's government is a closed loop system, and it will take all the skill Senate president Joe Negron can muster to protect the state from the destiny of all closed loop systems that fail to adapt to changing circumstances. This is an important issue that all floridians need to rally around. We own http://furniturerefinishingtallahassee.com and we take great pride in our community and the environment.